Who in the world picked this name for a movie?! 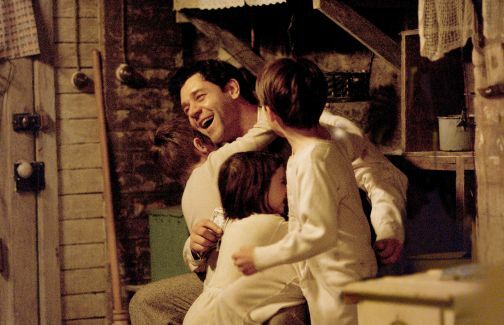 Cinderella Man... it's a phrase that can conjure up all sorts of weird images, yet a movie about an underdog boxer during the Great Depression just isn't one of them. Okay, forget about who came up with the title, I mean we all throw out dumb ideas sometime or another. What I wanna know is who approved this title? Who thought it would be a good idea? Yeah, after watching the movie I can understand where it came from, but the marketing people behind the film must have known that this title wouldn't draw people in. I know I surely had no interest in seeing it. But it seemed like every critic and reviewer out there loved it to death, so when i was asked if I wanted to do a review for it, I figured I might as well. The film is based on the true story of a boxer named James J. Braddock, also known as the Bulldog of Bergen. It starts out in 1928, just as Braddock becomes the light heavyweight champion of the world. The future is looking great, and not just for Braddock and his family, but also for his manager, Joe Gould. But then as we all know, the following year brought with it the stock market crash and the beginning of the Great Depression. Like most people, Braddock lost everything, and struggled just to put food on the table. He worked on the docks whenever he could get himself selected out of the mob of people also begging to work. And when he wasn't doing that, he continued to box, often times even when he was injured. Then, in one particularly pathetic fight in which Braddock fought with an injured hand, he accidently punched into the top of his opponents skull, breaking his hand in several places. And to top it off, he was told that his fighting had been so poor that he was no longer allowed to box. From there, things continued to go downhill. He couldn't afford to keep the electricity turned on, or the gas, or even feed his family. At one point he even filed for government relief, and went begging to some of the wealthier people he used to know. Braddock was a good upstanding guy. He didn't want to take handouts, but it was a pleasant surprise to see that he would put aside his pride and do whatever it took short of breaking the law to keep is family together through these rough times. Other's must have seen this too, especially his manager, who was able to present him with an opportunity to fight due to a last minute cancellation. The year was 1934, and he hadn't boxed in quite a while. Everyone, including himself, expected him to lose, though he could care less since he got paid either way. The fight was against John "Corn" Griffin, and to everyone's surprise and amazement, Braddock took him down in the third round with a knockout. It was only supposed to be a one-time fight, but this upset began the launch of Braddock's comeback. He was given another fight, this time against John Henry Lewis. Once again nobody figured that Braddock would actually win, but once again he did. I should say nobody "at the time", because anyone watching the movie would figure that Braddock was going to win. I mean, would kind of true inspirational comeback story would have him lose? Anyway, so then he gets another fight, this time against Art Lasky, and once again he wins. Winning these fights set up Braddock to become the top heavyweight contender, and so his next fight, and the final inspirational fight of the movie, would be for the heavyweight title against the current heavyweight champion Max Baer. I wonder, is it really possible to spoil the ending? So, was this a good movie? Yeah, it was alright. Better than I expected. The acting was really good from just about everyone, and the period really felt authentic. There were a few scenes I think they should have done without, and it did seem to start out a little slow for my taste, though I don't really know how they could have sped things up. To truly feel for this guy and his comeback, they had to really show the hard times that he and his family suffered through. So although there wasn't much action going on, most of the scenes were pretty much necessary. I definitely don't think it was "one of the best movies ever", which is a quote by Larry King that they have on the DVD case, but then again how much do Larry King and I actually have in common? Somehow, I doubt it's very much. So that's the movie, now about the DVD release. This is a great DVD release, as there are a ton of extra features. Starting it off is three full length audio commentaries, one with director Ron Howard, one with writer Akiva Goldsman, and one with writer Cliff Hollingsworth. Next is some deleted scenes, each with an optional commentary by director Ron Howard. 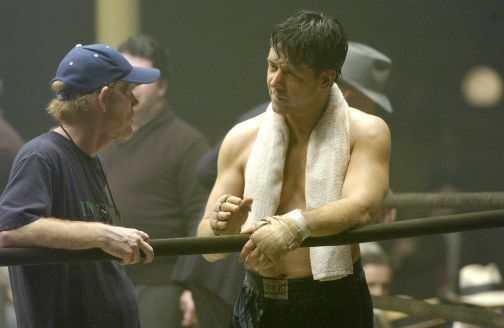 Then we have a bunch of featurettes, like one showing the casting process, one showing the making of the film, one about the history of boxing, one about Russell Crow becoming the character of Braddock, and on and on. At least that's what I got. My version does say "Not Final Product", so who knows if all of this will be in the final version. Let's hope they are, though, because all of them are pretty good. I never got bored while watching the extra, which can happen a lot of times. 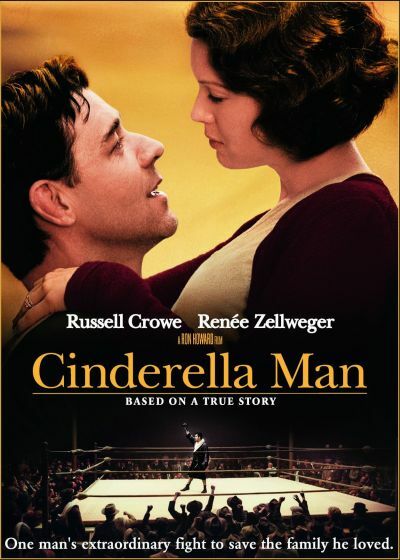 Cinderella Man is being released by Universal Studios Home Video on DVD starting December 6, 2005. 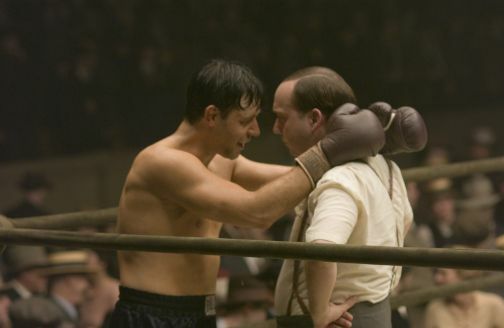 It was directed by Ron Howard, and Russell Crowe as James J. Braddock, Renée Zellweger, Paul Giamatti as Joe Gould, Craig Bierko, and Paddy Considine.